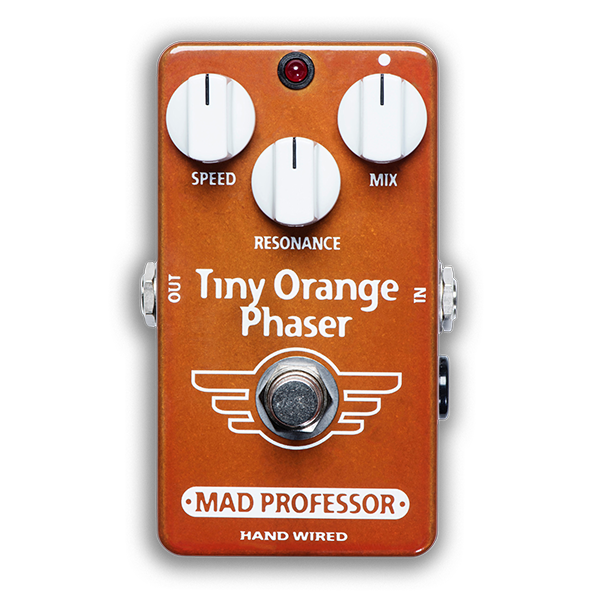 Unlike most vintage phasers the Tiny Orange Phaser is specially tuned for electric guitar. Unlike most vintage phasers the Tiny Orange Phaser is specially tuned for electric guitar. The tone is very musical and balanced thanks to carefully hand matched parts in the circuit. With the three controls, you can fine-tune the phaser effect to your taste. Speed control sets the modulation speed and Resonance adjust the tone of the effect, making it sharper when increased. The Mix control works in a unique way and at 12 o’clock it disables the phasing effect. If you turn the Mix control CCW (left) you will get a deep phasing effect. CW rotation (right) will adjust a lighter phasing effect. The Mix control is the key for setting phaser tone from mild into deep effect. Speed range and amplitude of the internal oscillator are set to allow high phaser speeds without getting erratic. You can find classic phasing sounds at about 12 o’clock Speed setting, the lower settings produce a nice floating “Vibe”- type of sound. Like all Hand Wired MP pedals, TOP is hand made in Finland using only premium components, to give years of trouble free operation with superb musical tone.